There's no bigger mojo in this perilous, unforgiving jungle of job hunting than a college degree. In an economy like this, a degree from a respected institution of higher learning can mean the difference between a safe haven among civilized, productive people . . . and sitting in a big pot amid hungry cannibals, wondering "Is this water getting hot, or is it just my nerves?" No, you can't overstate the importance of a college diploma. Take this one, for example (above). Listen, it takes four years and a lot of money -- money you likely don't have, not these days -- to get that piece of paper that tells super-picky employers "Me am smart. Me can does job!" And in a world where nobody knows what tomorrow may bring . . . in a world where you need to grab an elusive position while the grabbing's good, you don't have four years to putz around getting "educated." Well, friend, I can help. 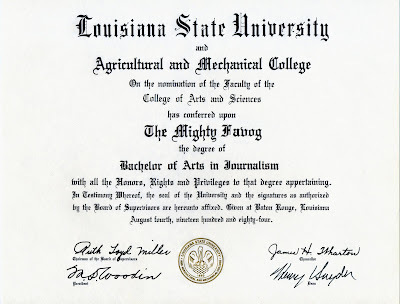 For the low, low price of $2,500 -- less than the cost of one year at a cut-rate public institution of higher learning -- you can be an official 1984 graduate of Louisiana State University and Agricultural and Mechanical College. Upon receipt of an envelope stuffed with cash, or a U.S. 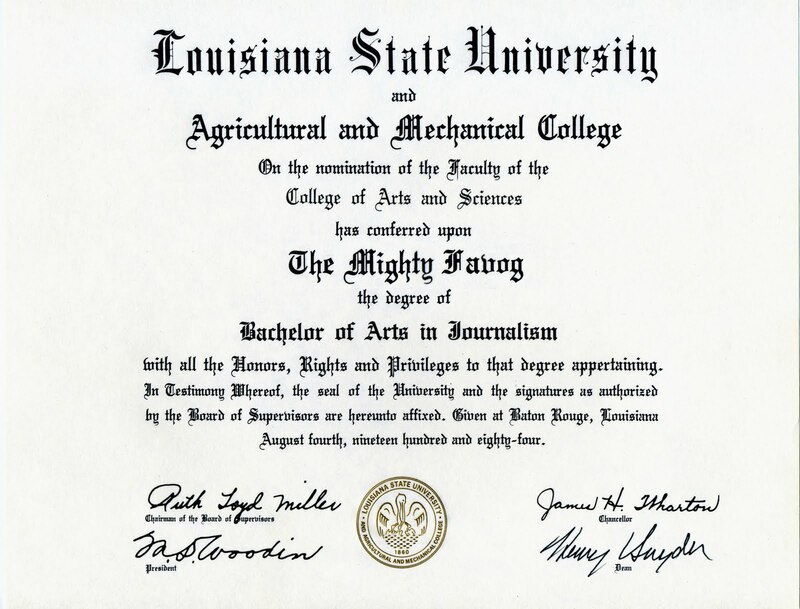 Postal Service money order (no checks, please), I will send you this bachelor of arts degree in journalism from Louisiana's flagship university. A journalism degree will open to you the doors of a lucrative profession. Or, if you prefer, this authentic LSU diploma also is an excellent entrée to graduate studies or law school. I KNOW . . . I know. Right about now, you're thinking, "Favog, this is fraud!" Well, of course it is, you twerp! This degree is from LSU, which is (DUH!) located in Louisiana, and fraud is how things work down there. For instance, Louisiana voters every four years elect the most plausible-seeming crook out of a field of several crooks, and then the newly-elected crook fraudulently pretends to govern, and the citizens fraudulently pretend to care. Each year, the fraudster-in-chief brings his plan for not governing before a bunch of less-accomplished frauds (this is called the Legislature), and they pretend to deliberate over shyster pieces of legislation, then sell their votes to the highest bidders, and it all eventually results in the fraud of a governor signing the fraudulent legislation into a joke of a "law." Then things really get screwed up. There's a method to this madness, and it is this: You can't run on a platform of "fixing" things unless things first have been rendered completely FUBAR. It's like the water cycle, only government. It's a very "green" process, actually. 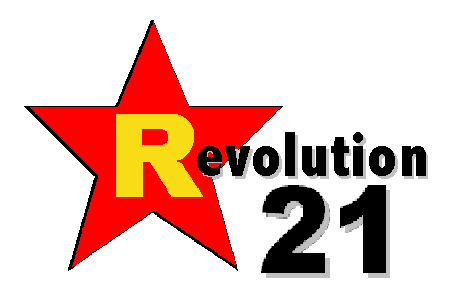 Now, under this "government" thing in Louisiana, politicians pretend to set up institutions of elementary, secondary and higher education. Of course, none of them educate anybody worth a damn -- that would screw up everything. Remember, in the economy of government-by-fraud, a little education is dangerous . . . and a lot is g**damned catastrophic, you bloody fool! Besides, education is among those things that must be "fixed," so politicians can run for office on a platform of lying to voters lying about wanting "fixes" about actually "fixing" them. SO, don't think of purchasing a used degree from me as "fraud," per se. Think of it instead as obtaining a perfectly valid college degree the same way LSU student athletes do. Or legislators' brothers-in-law. One or the other. It's just the "Louisiana way." One caveat, however. Act quickly, because the perceived worth of this genuine 1984 LSU journalism BA is likely to decrease markedly next summer. That is due to the havoc unfortunate economic circumstances are playing with the state's official Ponzi scheme, which in some states is referred to as "the budget." This disruption -- bravely papered over for several years through truly heroic fraudulence on the part of Gov. Bobby Jindal and legislators -- most likely will mean debilitating budget cuts, thus rendering plausible deniability impossible if some suspicious potential employer were to wave a newspaper in your face, screaming "That LSU degree of yours ain't worth s***!" But that's why I'm letting this authentic LSU diploma -- complete with a leatherette case at no additional charge -- go for just $2,500, a full 75 percent off the regular price. You still get a real college degree, with a good eight to 10 months to parlay it into a decent job. I, meantime, can recoup something out of the thing while there's still some value left. In Louisiana, we call this "Everybody wins!" You do a little somethin' for me, and I do a little somethin' for you. It's a system that works . . . if you don't worry too much about the meaning of "works." But, once again, act now. Sooner or later, Gov. Jindal will return to the Gret Stet from his 49-state "GOP: Fool for Me" concert tour, the legislature will convene . . . and LSU will turn into a pumpkin at 12:01 a.m., July 1, 2011. NOW THAT'S just between you and me (wink). It won't really be Louisiana State Community College until the carpetbagger feds make 'em change the name because of damn-Yankee "truth in advertising" laws. So buy today! Remember, "what a waste it is to lose one's mind or not to have a mind is being very wasteful. How true that is."